Masters of Doom is the amazing true inside story of the Lennon and McCartney of video games: John Carmack and John Romero. Together, they ruled big business. They transformed popular culture. And they provoked a national controversy. More than anything, they lived a unique and rollicking American Dream, escaping the broken homes of their youth to co-create the most notoriously successful game franchises in history – Doom and Quake – until the games they made tore them apart. North Americans spend more money on video games than on movie tickets. 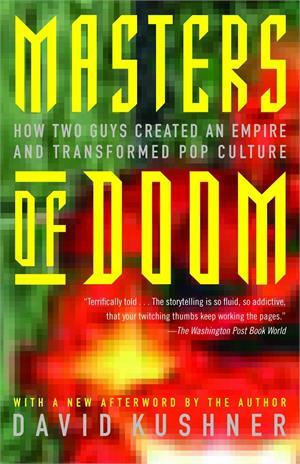 Masters of Doom is the first book to chronicle this industry's greatest story, written by one of the medium's leading observers. Award-winning journalist and author David Kushner takes you inside the rags-to-riches adventure of two rebellious entrepreneurs who came of age to shape a generation. The vivid portrait reveals why their games are so violent and why their immersion in their brilliantly designed fantasy worlds offered them solace. And it shows how they channelled their fury and imagination into products that are a formative influence on popular culture, from MTV to the Internet to Columbine. This is a story of friendship and betrayal, commerce and artistry – a powerful and compassionate account of what it's like to be young, driven, and wildly creative. David Kushner is an award-winning American journalist and author. A contributing editor of Rolling Stone, he has written for publications including The New Yorker, Vanity Fair, Wired, New York Times Magazine, New York, and GQ, and has been an essayist for National Public Radio. He has taught as a Ferris Professor of Journalism at Princeton University, and an adjunct professor of journalism at New York University.